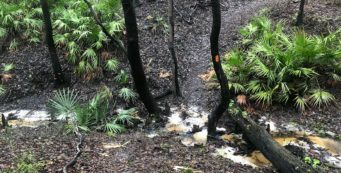 Florida Trail, Vilas to Camel Lake | Florida Hikes! 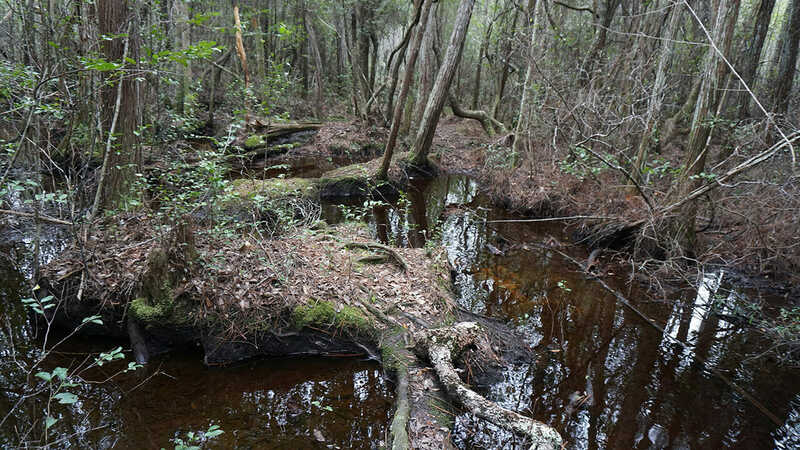 Pine flatwoods and swamps: that’s what you expect on a hike in the Apalachicola National Forest. Along this segment, both are particularly beautiful, occasionally challenging, and enjoyable to traverse. 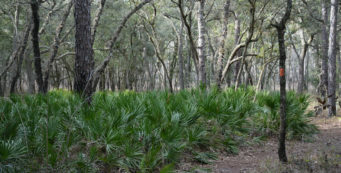 Broad vistas of towering longleaf pines yield to dark tunnels through gum swamps and leafy walls of titi, where carnivorous plants thrive. Rolling sandhills cradle creeks and ponds. 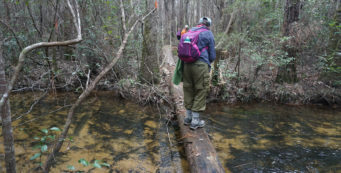 Showcasing such a variety of complementary habitats, this is one of the best hikes in the Apalachicola National Forest for botanical diversity. Because it is so remote and the crossing is lengthy, Shuler Bay can be troublesome to cross if it’s flooded. Check the water gauge for the region in advance of your hike. 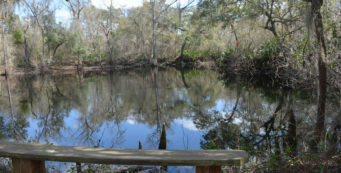 This section of the Florida Trail lies 12 to 13 miles south of SR 20, west of Tallahassee, between Hosford and Bristol. From Capital Circle West, follow SR 20 for 28 miles to Hosford to reach CR 65. Go south for 3 miles to the crossroads at Telogia. Continue another 10.4 miles to the turnoff onto CR 120, a left turn just before the New River bridge. If you pass it and cross the bridge, you’ve gone too far. Less than a half mile along CR 120, an unpaved road, you’ll find the Vilas trailhead on the right hand side after the old railroad crossing. There is space for 3-4 cars. For the western terminus of this hike, continue along SR 20 another 11.2 miles past Hosford to CR 12 south in Bristol, the last traffic light before the bridge over the Apalachicola River. 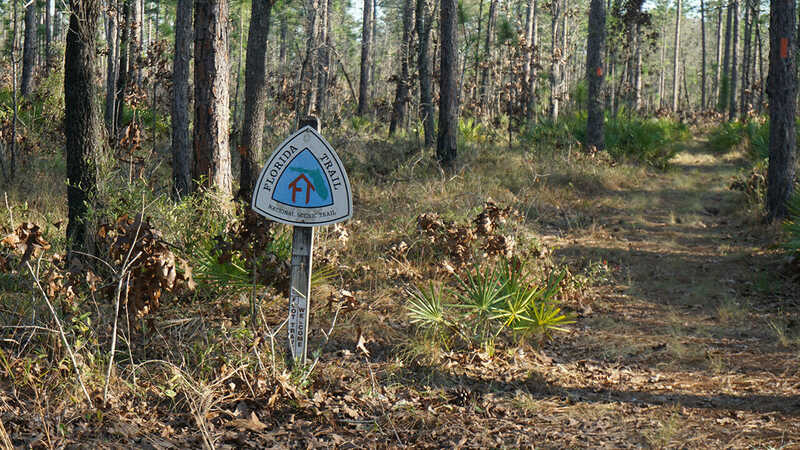 Drive south 11.5 miles on CR 12, passing the Savannahs trailhead and the Apalachicola National Forest Work Center just before you see a sign for Camel Lake. Turn left onto FR 105 and drive 2 miles on this sometimes-bumpy unpaved road to the recreation area on the right. A $3 per vehicle per day use fee applies to use the parking area, which also grants you access to real restrooms and the picnic/swimming area along the lake. Cars can be left for multiple days for a fee (the gates are locked at night) should you wish to use Camel Lake as a launch point for a hike across the Apalachicola National Forest eastbound (trail south). Just check with the camp host before doing so. 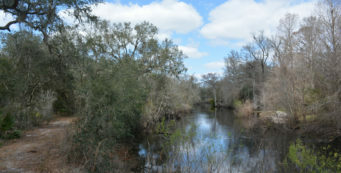 Heading west from Vilas, the Florida Trail follows the edge of titi swamps along the New River floodplain along the ecotone with pine plantations. 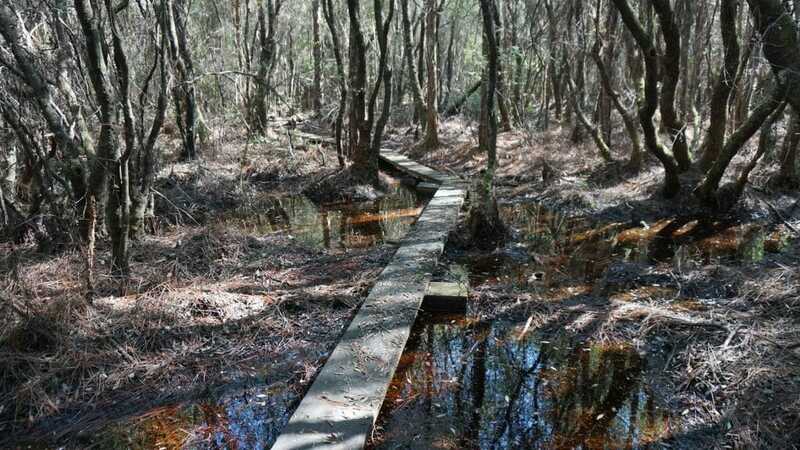 Diving into a gnarly swamp that takes some tricky footwork to traverse, it pops out through a pitcher plant bog before ascending to soggy pine flatwoods on the way to the floodplain of Hostage Branch. 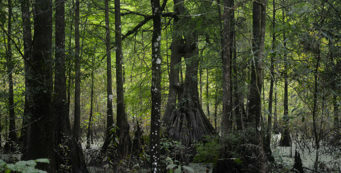 After a pleasant mile of stately longleaf pine forest, the trail dives into the second largest swamp you’ll find in the Apalachicola National Forest: Shuler Bay. But unlike the crossing of Bradwell Bay, this one offers a puncheon boardwalk more than a half mile long, the longest such boardwalk on the Florida Trail. Pine flatwoods and colorful sandhills dominate the remainder of the hike, with pretty Bonnet Pond a highlight on the way to Camel Lake.